Heat up your smoker cooker between the temperatures of 235° and 250 ° F.
Use fruit woods in your smoker cooker to intensify the flavors in the turkey. Place your turkey in a disposable roasting pan. Continuously add wood every 35-40 minutes (as needed). 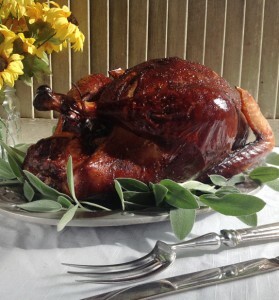 *In order to avoid a too smoky taste from your turkey, add small amounts of wood to the hot coals. This process will get your fire to burn clear heat.